Figure 1. Close-up of the Shaver portrait of David Haynes. Figure 2. Close-up of the Shaver portrait of Rhoda Taylor Haynes. 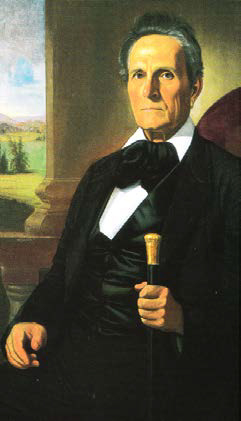 David Haynes was born in Virginia in 1788. Shortly after his birth, David’s father, George, relocated the Haynes family to Washington County, Tennessee. David had no formal education, but became a wealthy farmer, land speculator, surveyor, and slaveholder. He also was a millwright as he built and worked with several mills in the surrounding area of Carter County, Tennessee. In 1816, he married Rhoda Taylor, making it his second marriage. 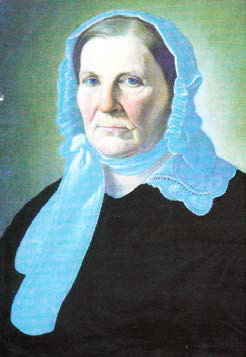 Rhoda was born in 1795 in Tennessee and was the niece of General Nathaniel Taylor, War of 1812 hero. David and Rhoda lived in Carter County, Tennessee until their deaths. Rhoda died in 1861 and was buried in the Haynes family cemetery in what is now Unicoi County, Tennessee. David died in 1868 and was also buried in the Haynes family cemetery. David and Rhoda had twelve children, seven boys and five girls. Landon Carter Haynes was their first child.